Hello and Welcome to Winnie & Walter’s Monthly Rerun Feature! Rerun is a feature at Winnie & Walter’s blog which runs first week of every month where one product is featured and that product is on sale for the entire month. There are plenty of inspiration using that product on W&W Blog for you by the designers and there is also a challenge. This month we are featuring Scenery: It’s a wonderful Pennant stamp set. I made a set of of cards using the smaller pennant images from the stamp set. I will first share the set of cards and explain the process then share photos of each individual card. The process is simple. 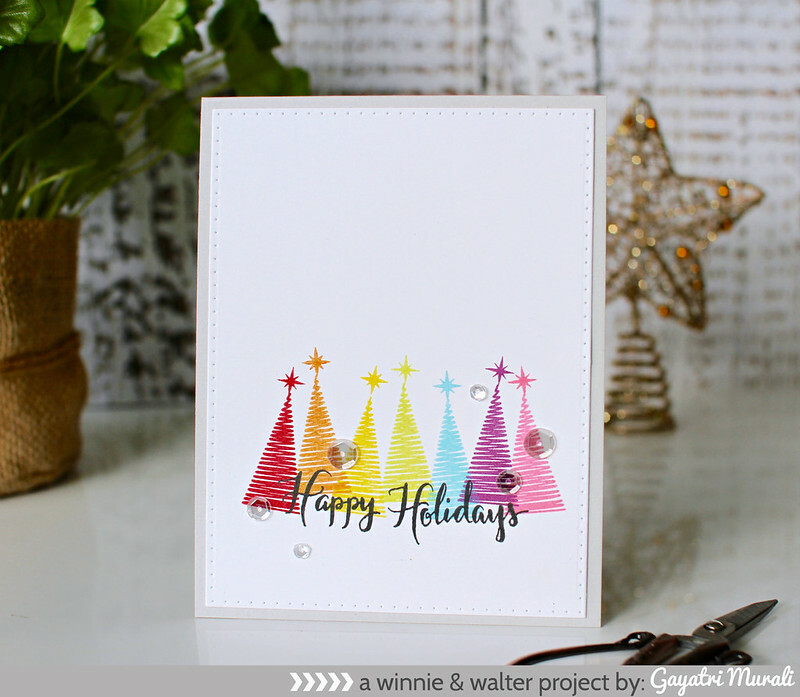 I die cut four white panels using the largest rectangle die from Essentials: Katharine Cutaway. I then used pigment inks in rainbow colours to stamp the images on the panel. There are four patterned smaller pennant images in the stamp set. I stamped each images in rainbow colours slightly overlapping on each of the panels. I also stamped the star on each of the image with the corresponding colour. Since I used pigment inks, the colours are vibrant. 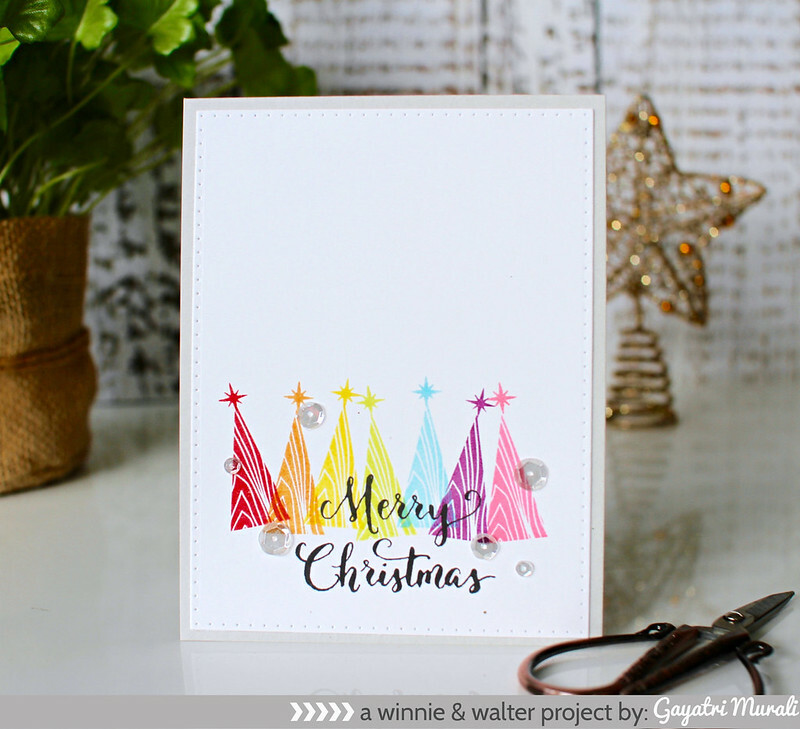 Love that especially since this is a clean and simple kind of one layer card, the colours make a lot of impact. 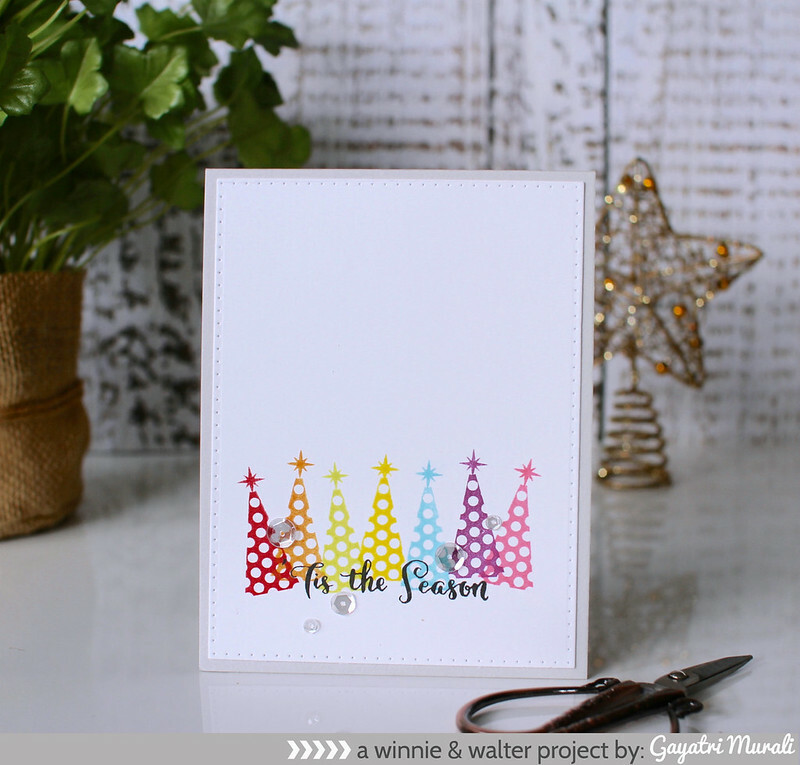 Then I used the sentiment from Merry & Bright with Evelin T Designs stamps set to stamp partially on the rainbow coloured images. I used Versafine Black Onyx pigment ink. I love this ink for its clean and crisp stamping particularly for detailed images and script sentiments. I finally embellished the panels with Sparkly Clear sequins from Pretty Pink Posh. I adhered the panel on Fog card base. Here are the photos of the individual cards. These card can be mass produced and easy to mail as well. Die cut the panels, grab your inks and the stamps, sit in front of TV and stamp away! If you want to take it up one notch, then heat emboss the sentiment. But make sure the pigment inks are dry or stamp using dye inks. Adhere the panel using craft foam for added dimension. Hope you like my cards. 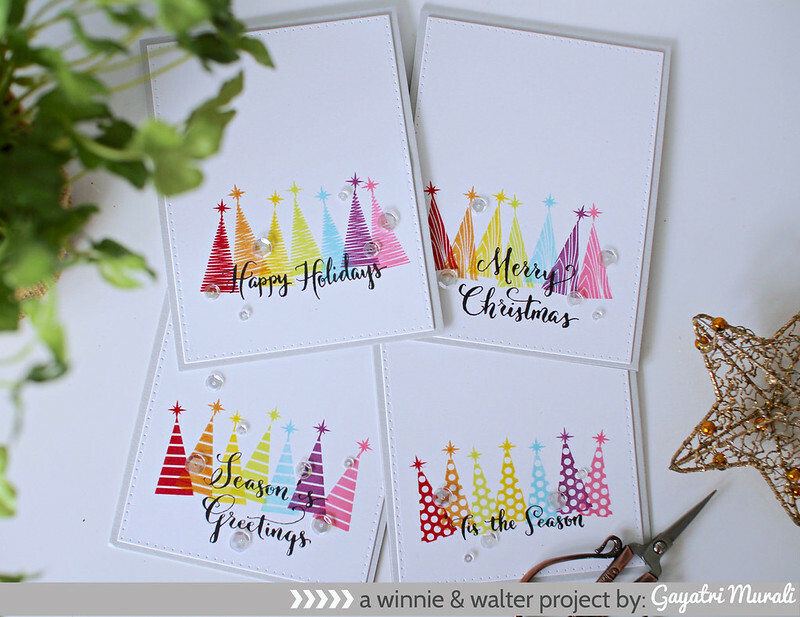 Head over Winnie & Walter Blog for more designer inspiration as well the details on the challenge. Thanks for stopping by my blog today. Happy Friday and enjoy your weekend. 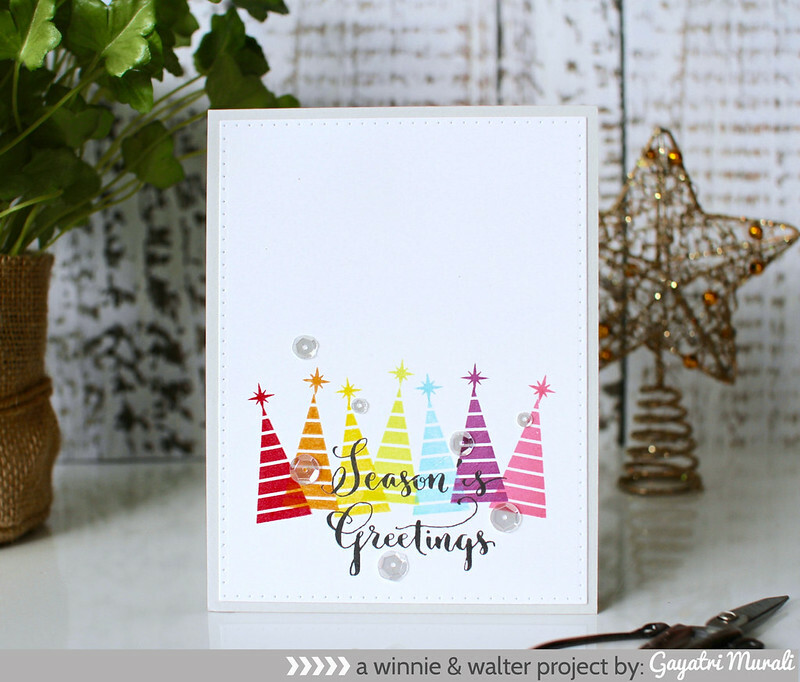 Very pretty Gayatri – love the overlaid sentiment too! I DO like Gayatri. They look stunning. I really enjoyed making a couple of cards inspired by yours. They are really pretty in the rainbow colours.